Button love today~all kinds!! My all time time favorite embellishments is buttons. They come in all different sizes, shapes, colors and styles!! Buttons are beautiful~just like rhinestones, beads and stones. This card is using the button set by Stampin' Up!. I love how these four colors went so well together and depending on the color combo ~blue's for boys, pink's for girls etc ~this style would work for many card themes. Love that!!! Just wanting to make sure you see how super cute these are!! 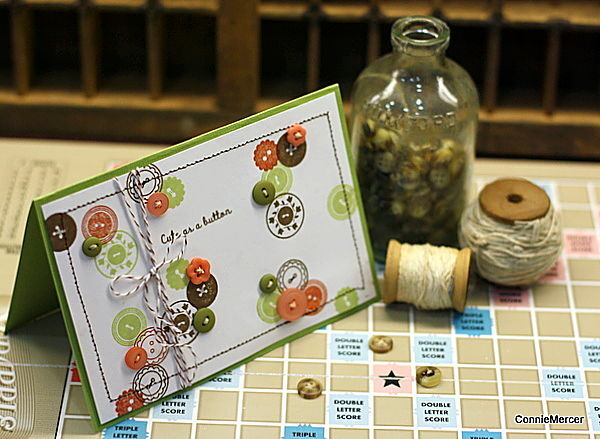 The stamp set comes with button stamps also~so the cards could be made into a flat embellishment!!! 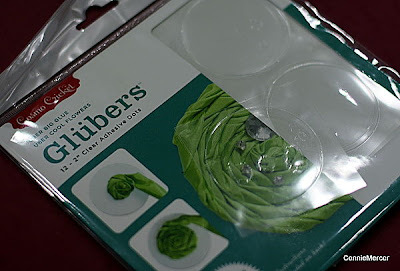 I have several favorite products that I plug on my blog because they are so clever!!! This is one of those~ I love making flowers out of ribbon and this makes it so easy and the end result is perfect!!! Thank you Cosmo Cricket for Glubers!!! 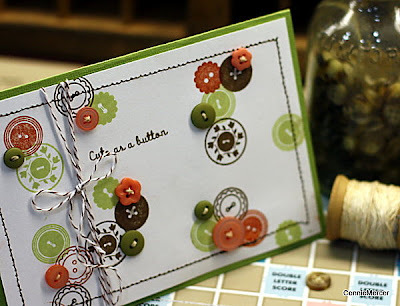 Love your card, those button stamps are sooo cute!! 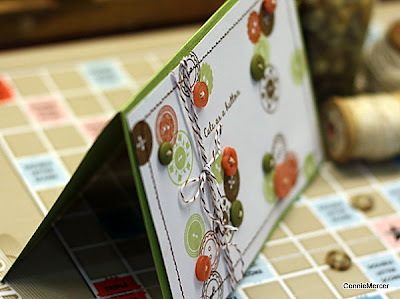 I am going to be on the lookout for that Stampin' Up set. LOVE what you did with it. Cute flowers, too. I took my first photo with the floral frogs. :) LOVE how much simpler it makes things. I just LOVE ..LOVE ..LOVE the way you showcase your designs!! You are so creatively talented!!! 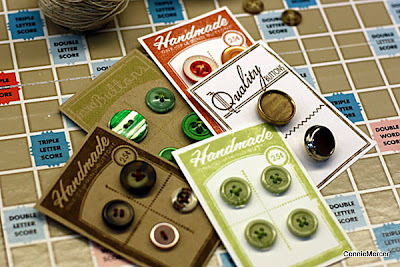 i am right there with you on the love of buttons--they are my fave. already a follower and would love to win!!!! that is soooo soooo cool. i love the cards. they rock!!! as usual. HOLY CUTENESS!! That card is so adorable!! Great Job! Love the button card! They are one of my favorite embellishments too! We must be on the same wavelength, My PTI order with Button Botique just arrive this week! I'm so excited to make some of those cards!! I love these cards of buttons - the green card is perfect! 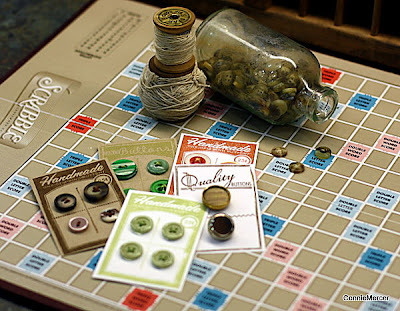 I love to sew so I am always intrigued by products that combine my two favorite hobbies!!! Thanks for the give-away. I follow on Google reader! Eeeeeee buttons are the best! My friend and I hve been talking tonight about how we always need more buttons! I'm with you I LOVE buttons. These are really cool. I really like your card and the stamp you used. Wonderful. WOW! Those button sets look just like real vintage button cards! You did such a great job putting them together and oh how I love that first card with the stamped buttons and the added on buttons. the papertrey ink stamps are so gorgeous - so tempting! 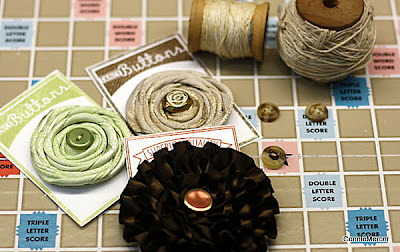 your button cards and Gluber ribbon flowers are also fabulous!! thanks for seeing me over on my blog and becoming a follower - kind deed reciprocated! The buttons and colors are adorable!